The seafood festival along the pier in Downtown, Boston is an amazing site to see with thousands of people filling the area with friends, family, and tourist. Both sides of the pier were filled with tons of seafood vendors, activities and performances that lured the attention of guest. A very well put together event on all ends! Being apart of the festivities was an amazing honor, considering that we got to do something that we enjoy most...helping children have a great time! 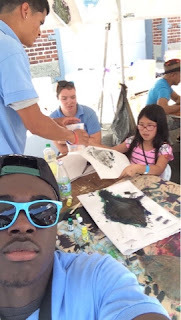 Along with just talking to kids and families getting to know them and ask about their experience while out at the festival, the Save The Harbor/Save The Bay staff welcomed them to fish print several of our pretty flounders caught inside Boston Harbor. 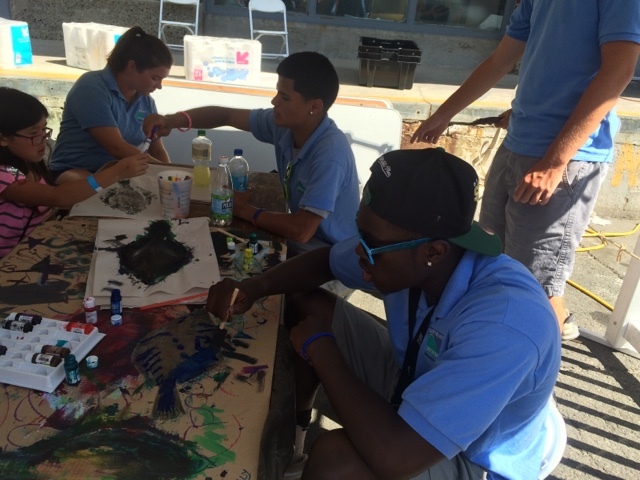 The kids were really creative and used their imagination to mix colors and create awesome fish prints. It was also really cool to teach people who have never seen a live fish that close right before their eyes how to do fish prints. I even did a print myself that was pretty cool! Looking forward to printing again!